DRYSTAR AXYS is a dual film size, Direct Digital imager with excellent image quality. DRYSTAR AXYS offers a great range of possibilities, despite its compact size. It can be used in both centralized workflows and with dedicated applications. Fitting a full range of applications, it also features daylight handling for the two on-line media trays, with five media sizes and three different media types available. The imager thus offers enhanced flexibility and convenience, and the ability to use multiple media sizes makes the DRYSTAR AXYS suitable for all applications. In addition, its ultra-short access time for the first five prints, as well as its efficient throughput, provide increased productivity. 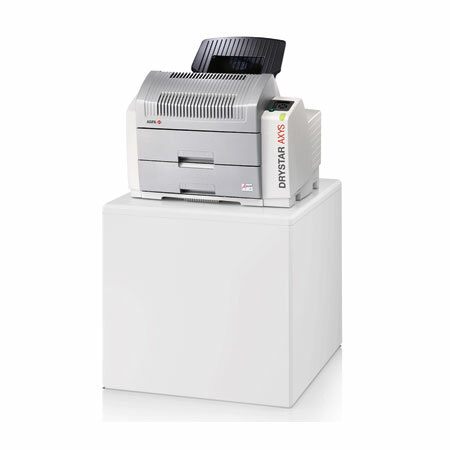 As with all of Agfa HealthCare’s DRYSTAR family of imagers, DRYSTAR AXYS features Direct Digital Imaging (DDI). This solid-state technology avoids the use of complex optical components, for an imager that is more reliable and durable by design. In addition, DRYSTAR AXYS is ecological and user-friendly, requiring no wet processing, darkroom, complicated adjustments or cleaning procedures. Environmentally-harmful chemicals, waste handling and disposal costs are things of the past.